IoT is Hot. Not surprisingly, when you picture wearable devices, sensors and smart machines that are connected to the internet – all eager to make lives easier, provide information, react and interact with the human world. But in the business world, something is missing. Where is a system that can integrate IoT devices with mission critical business processes? That system is very likely BPM. Business Process Management suites have become the leading technology for fast, enterprise-changing systems which optimize and streamline workflows for organizations in nearly every industry. What if these two awesome forces – IoT and BPM – could be combined? 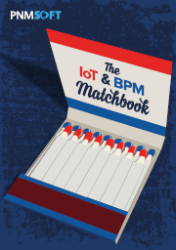 In this pocket-sized BPM & IoT Matchbook, we explore the possibilities opened by matching IoT devices with BPM technology. We’ll take a peek at the awesome potential of wearables to be connected to business processes, a hot field that’s just waiting to explode. We’ll examine Business Moments – those precious opportunities in the life of a business which could be ignited with the help of IoT and BPM. Finally, we’ll explore the awesome potential of IoT devices that are integrated with a BPM-powered Case Management & Work Optimization suite. We look forward to enlightening you about this mushrooming new field. All the possibilities are there… all that’s needed is a little spark.